In May, 2005, a new editor put paid to my writing articles of a political nature in the Herald, Port Elizabeth. I had had a good run, having first launched into action in 2000, as these postings reveal, in the wake of the Mugabe clampdown on democracy in Zimbabwe. Anyway, I was now confined to writing art crits and the odd book review. Of course this was all done over and above my actual job of working as a sub-editor on the Herald, which I started doing in 1994, after 10 years as a news reporter. 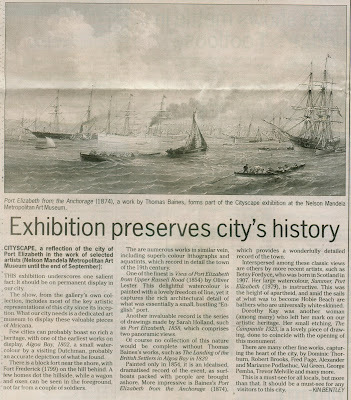 I was to carry on with my art crits for the next five years, when the advent of another editor brought to an end nearly 20 years of doing this work on the Herald. 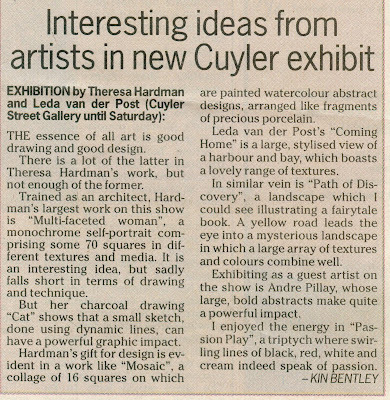 Tossie Theron's little Cuyler Street Gallery in Central kept me on my toes. She staged a new show virtually every fortnight, and made sure I wrote a preview and a review. 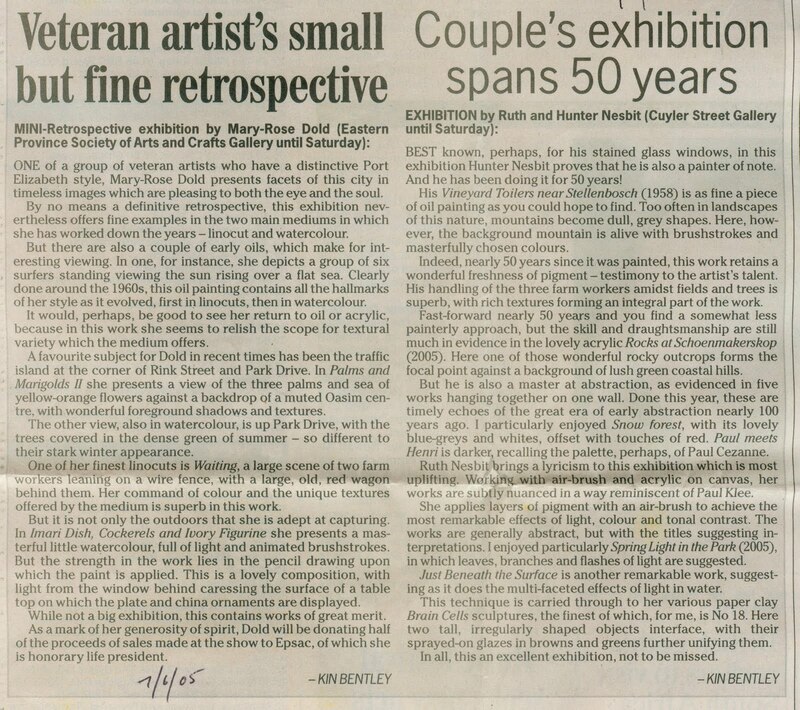 So here, on the right, is a crit of an exhibition by Ruth and Hunter Nesbit, from June 7, 2005. On the left is one of a show by Mary-Rose Dold, the doyenne of PE artists. 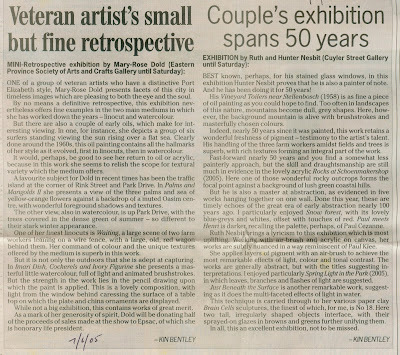 The Ron Belling Art Gallery, in Park Drive, also stages regular shows. 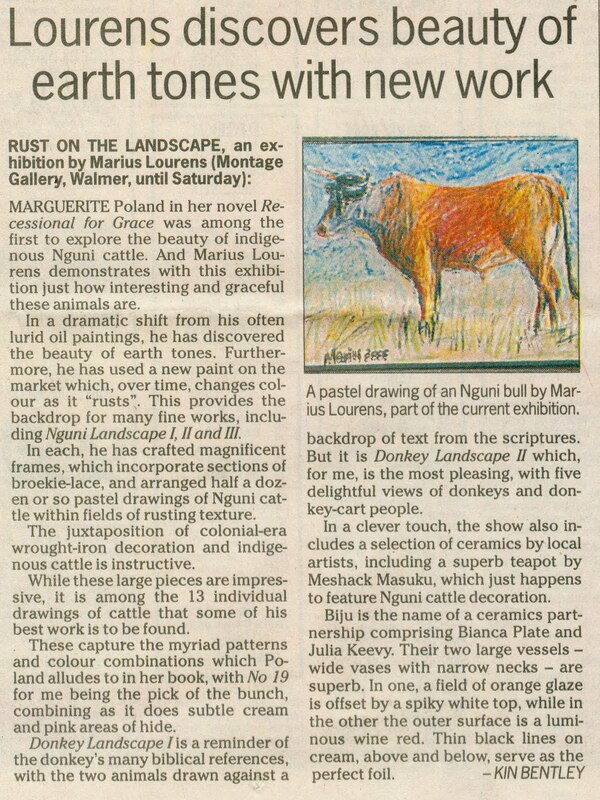 Here is my review of another by Tony Grogan, from July 8, 2005. The main municipal gallery often stages specialised shows of selections from its permanent collection. This one, Cityscape, I reviewed on August 2, 2005. 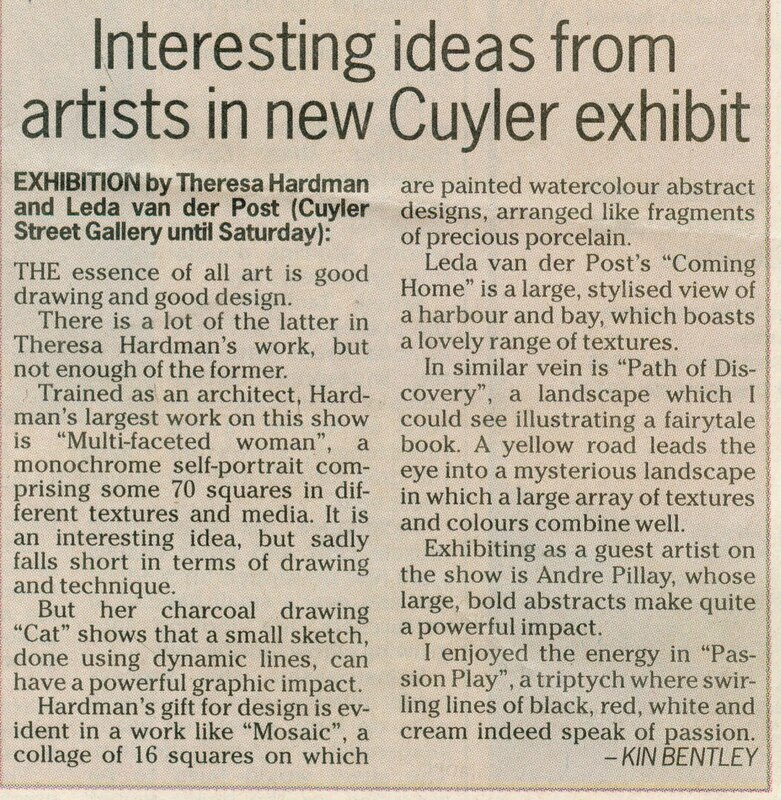 My review of a Theresa Hardman show from August 13, 2005. 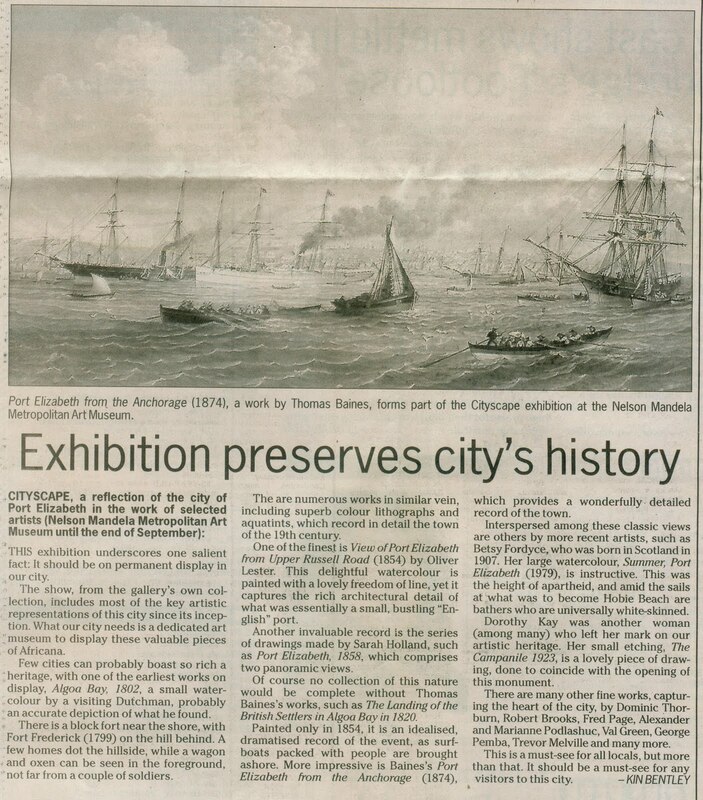 Every year the main municipal gallery, the Nelson Mandela Metropolitan Art Museum, hosts an exhibition by the Standard Bank Young Artist of the Year. 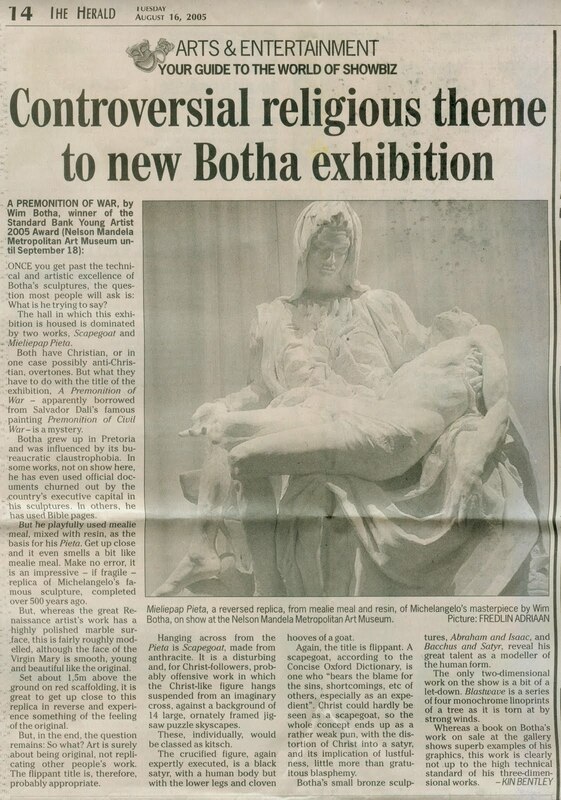 My review of Wim Botha's show was run on August 16, 2005. 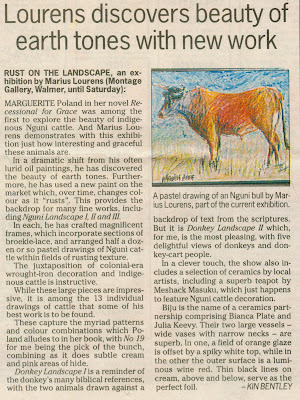 My review of a Marius Lourens exhibition from August 22. 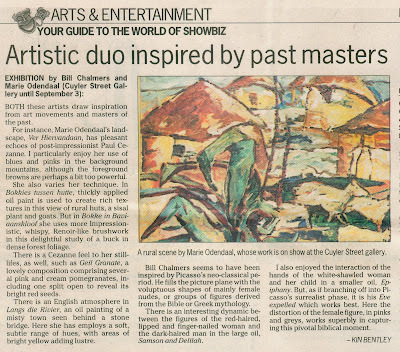 A review of a show by Bill Chalmers and Marie Odendaal from August 25. 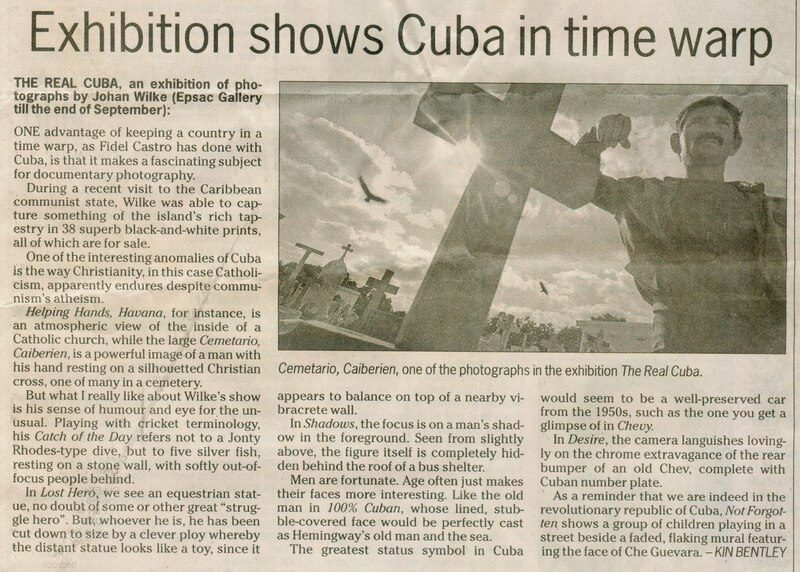 Johan Wilke exhibited photographs taken in Cuba. This is my review from September 15, 2005.